He always carried a pocket knife, just as his father and grandfather had done. His was a small one, two blades, both of which were kept sharp and ready for whatever chore befell them. They whittled sticks onto which hot dogs and marshmallows were pushed, they scraped corrosion from battery posts, cut the tags off the new plaid, flannel shirt and extricated splinters and briers from his tough skin. They also taught lessons about life. One evening, when his teenage grandson was visiting from out of state, he told him they would rise early and take a walk in the meadow and forest; he had something important to show him. He’d fix them a breakfast of oatmeal and Cortland apples, then put on their dew gear and take a walk. The taste of cinnamon and brown sugar lingering in their mouths, they left for the meadow; the man’s aged black Lab led the way down the brown path. Neither the boy nor his grandfather said much at first. They commented on the chill, the heavy dew and how it seemed as if the dog had slowed down quite a bit from the boy’s last visit, in the spring. Seeing a gall on weed, the grandfather stopped, pulled out the knife, cut open the gall and revealed its contents. It smelled like pepper, the boy observed, and they tossed it aside and continued to walk toward the forest. Twilight gave way to dawn. The first rays of morning crawled across the meadow. He stopped next to a tall weed onto which a web hung in the motionless air, and invited his grandson to study the complex structure. The sun was at their back, and the web, shaded from the light, appeared dull and lifeless. Then he told his grandson to walk around to the other side. A ray of amber sunlight hit the web perfectly, revealing hundreds of aquatic jewels dancing on the slight breeze. He pulled out his pocket knife and opened it to the small blade. Handing it to his grandson, he invited him to see how many of the connections he could break before the web collapsed. The boy began his work of slicing through filaments. 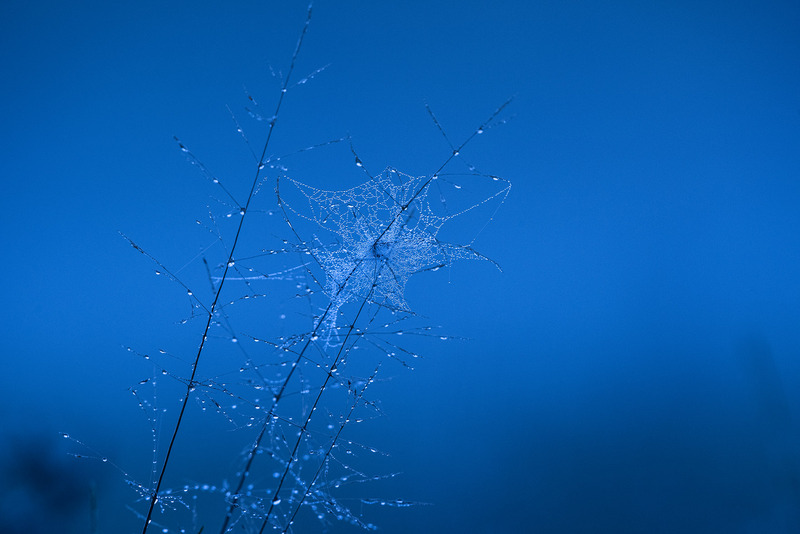 The web shuddered with the slightest touch and set loose dewy tears that crashed onto filaments below. Each additional slice of the sharp blade was more devastating than the previous to the greater web, which eventually collapsed into a mass of tears. “I want you to imagine that this web represents our society,” he said. “That every filament that runs between the connecting points represents a relationship between two humans. Indeed, imagine that each one represents marriage, like the vows that unites your mother and father. “When the filaments are connected, the web is strong. It can hold the burdens of life, the tears that accumulate on the web because we live in a fallen world. But did you notice that when you sliced through those filaments and destroyed the web’s foundation, those tears were released upon other strands? Eventually, when you cut through enough of the strands, the whole web collapsed. He wiped away the tears from his eyes, took the knife from his grandson, wiped the dew from the metal, closed it and slide it back in his pocket. The Lab nudged the man’s hand; it was time to go back to the lonely house that he bought following the divorce.